Eighteen days 'til March 21st, and we are steam rolling. E! got down and dirty on the bar floor today. 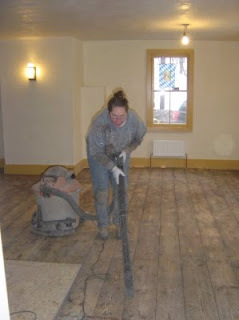 As you can see, sanding the bar floor is dusty and dirty work. 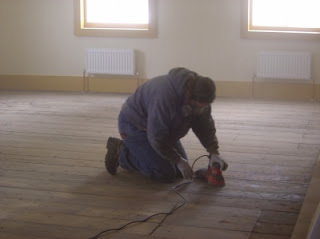 Now, you may wonder why we didn't just rent a floor sander to do this kind of work. First of all, we tried that with the Stube floor, with mixed results. Second, originally E! just wanted to sand a few spots, but mainly clean the floor with Murphy's Oil Soap. Clearly that didn't happen, and she must have caught a bug that made her (hand-) sand the entire bar floor. 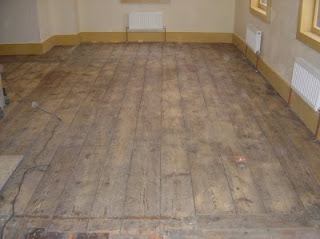 ... and although the picture may not show it properly, the floor looks gorgeous. Tomorrow it will be oiled, and made look even more gorgeous. I finished the heat in the Stube. Now the entire first floor is fully heated. We are so excited for you!!! If you were open, i would have been there today for lunch. I needed to get OUT! 18 more days!!! !